This is a quick video of how the Upham Family fulfills the commandment "to remove the leaven from your homes" on Passover (See Exodus Chapter 13 for the details). We try to keep this tradition fun and educational for the kids, showing them that leaven is a picture of sin. Just as we remove leaven from our physical dwelling place, we should always strive to remove leaven from our spiritual dwelling; the heart. Yeshua himself did this by remove the money changers from the Temple. He was cleaning the leaven out of his Father's house. This story begins several years ago with the introduction of Pampered Chef Stoneware to my kitchen. I understood at the time that it was “impossible to burn things” if you cooked on stoneware… It would keep your meats moist if you cooked in stoneware… You would have crispy crusts but tender centers in your homemade bread if you cooked on stoneware… All of these things have turned out to be true and through the years my collection and admiration of stoneware has continued to grow. When my first installment of stoneware came it became my mission to “season” it. Because of the attribute of the stoneware opening itself to the flavorings of the food that it is cooking it takes several uses for it to create a “non stick” layer of seasonings. One of the hardest things for me to get used to about my stoneware is how you wash stoneware. You are never to use any soap on a stone ware! The stoneware should be cleaned of all food particles and residue with the hot water and the little silicone scrapper that comes with it. Again, it is because the stoneware absorbs the flavor of whatever comes in contact with it. The soap flavor would be present the next time you baked with it. Heartache would come if you ever broke a piece of stoneware because the long tedious process of re-seasoning a piece would have to commence again. Remember one works hard to achieve a seasoned piece. Now, let’s fast forward a few years… The relationship with the stoneware is going well, I haven’t had to replace a stoneware in a while. The Stoneware has continued to hold a prominent place in my busy kitchen until recently. We have moved into a new season of life as we have continued to walk in the Mitzvot of Adonai. We have been re-evaluating our level of Kashrut. (I recommend the book Biblically Kosher a Messianic Jewish Perspective on Kashrut by Aaron Eby- FFOZ)For the past year or so we have “separated” meat and dairy in our diets. This has been a beautiful reminder for us of what is life and death, and never to mix them. It has been a way to worship our L-rd with what we eat. However, as with many things in Hebraic thought one answer will bring several questions. If we are not to cook meat with milk does it make sense to cook meat and milk separately in the same pan? What about the same STONEWARE?!?!? Yikes! Because I have already explained the properties and attributes of the stoneware we see that this would certainly not be permissible. One example in the Torah of Koshering and a cooking vessel taking on the status of the food whose taste it has absorbed is in the parsha TZAV. Specifically Leviticus 6:20-23 in the Hebrew text. Lev 6:27 Whatever touches its flesh shall be holy, and when any of its blood is splashed on a garment, you shall wash that on which it was splashed in a holy place. 28 And the earthenware vessel in which it is boiled shall be broken. But if it is boiled in a bronze vessel, that shall be scoured and rinsed in water. 29 Every male among the priests may eat of it; it is most holy.30 But no sin offering shall be eaten from which any blood is brought into the tent of meeting to make atonement in the Holy Place; it shall be burned up with fire. Now I do realize that scripture is particularly addressing the issue of Holy foods in temple service. However it does address the issue of koshering or not being able to kosher earthenware (stoneware). Upon further research of how to kosher a kitchen I did find that there were a couple of different options to Kosher my stoneware that were permitted. From what I understand (and I’m new at this, may I remind you) to Kosher an earthenware it must be brought back to its original state. This can be obtained by burying it in the earth for a year, returned to the kiln to be re-fired, or lastly broken and replaced. The first option was to long and a little weird for me, the last one a little to costly, I found a variation of the middle option. The stoneware could be set in a self cleaning oven to be re-fired and brought back to a pure state. I was intrigued. I set my well seasoned stoneware in the oven for the long process that it would go through. I had read that because of the extreme heat and the prolonged time at that heat it may be possible that I would lose the stoneware anyway because it may break, but I thought it was worth a try. To my amazement in the morning my dark, stained, and well seasoned stoneware was white. I had recently purchased a new piece that has not been used yet and compared the two. I was impressed. Do you see the parallel yet? Only He can make us white as snow. Through this process I have learned that I am the earthen vessel. I am purified by fire. Sometimes I must be broken so the master can reshape me for His purposes. I was convicted as I was “labeling” my cooking vessels for its permitted use, that everything I put into my life should reflect, the use HaShem has intended for me. I just wanted to share my experiences with you and encourage you in walking in His ways. Purim 2012 - The Name's Bond, Yacov Bond. Happy Purim everyone! For those who are less familiar with the Holiday of Purim let me give you a brief introduction. The book of Esther records an amazing demonstration of G-d's redeeming power when He saves His Jewish People from total destruction. He does this by allowing a simple Jewish girl names Esther to become Queen of Persia. Because of Esther's courageousness, she endangers her own life in order to save the lives of her people, and Praise G-d, it worked! I know that was a very brief summery but if your interested, pick up a Bible and read the story for yourself (its not that long). There is a tradition that when celebrating Purim, you dress up in costumes! This tradition is based on the fact that Queen Esther hid her Jewish I identity until she saved the Jewish people. Also many other important characters in the Purim story disguise them selves with different costumes and garments during the events that unfold. Also the Book of Esther is the only book of the Bible that does not mention the Name of G-d. Seemingly G-d is not part of this story but one can clearly see that He is orchestrating every event in His divine plan. Because of these "disguises" throughout the story, we have a masquerade/costume party to remember the even though we may not recognize Him, G-d is always in control and working behind the scenes. 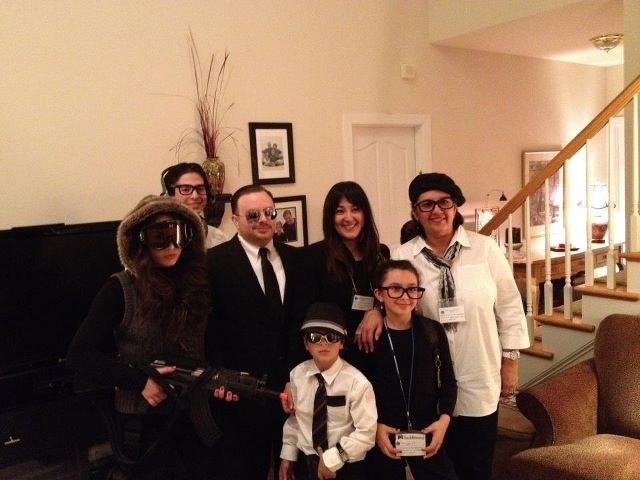 This year our family Purim costume theme was the Biblical Bond Servant Agency. Basically in Exodus 21, G-d lays out the instructions of the Hebrew Bond Servant. And in the Apostolic Scripture (New Testament) Shaul commonly refers to himself as "the Bond Servant of Messiah". So we though we would take it to the next level....James Bond style! Look Mom, no training wheels! it's official, the youngest Upham kid has conquered the bicycle! A year and a half ago, Hashem blessed us with the opportunity to visit the Promised Land of Israel along with some friends of ours. Words can not even begin to describe the immense blessing the entire trip was! Upon returning to the States, we quickly realized that when you leave Israel, you leave part of yourself behind. We can't wait to go back and pick that part up again. B"H! Here is a video that Jonathan made from our time in Israel. Enjoy! Stay tuned with what's going on by checking back frequently. For the sake of democracy, each family member old enough to spell will contribute to blog posts on a semi-equal basis.